I’ve been reading this year’s Independent Foreign Fiction Prize longlist (along with a group of book bloggers chaired by Stu) and this post covers my thoughts on another of the longlisted titles. 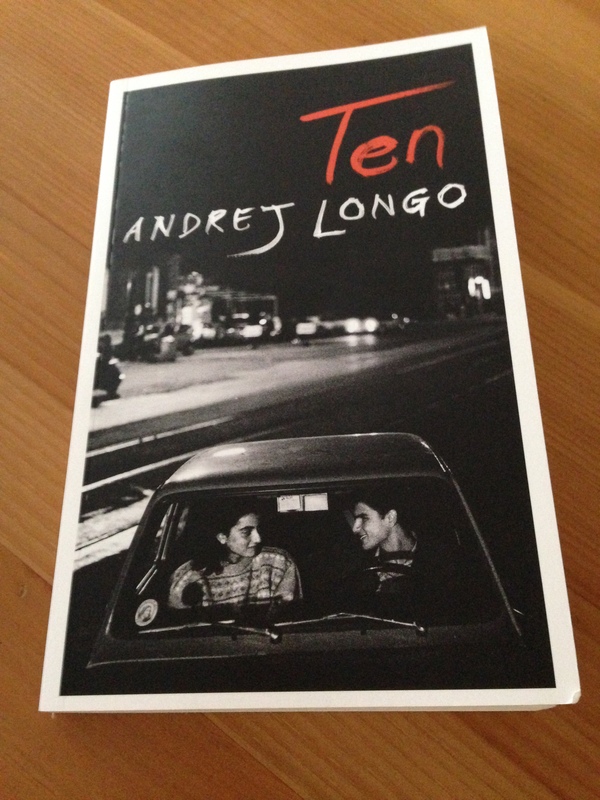 Andrej Longo’s Ten consists of a series of hard-hitting short stories set in Naples. Each story takes one of the Ten Commandments as its theme and we see regular working-class people struggling to get by in the face of temptations and challenges that come their way. Longo is a critically-acclaimed writer of short stories as well as pieces for the theatre, radio and cinema. When he isn’t writing, Longo works as a pizza-maker in the city of Naples and he draws on his understanding of the city to great effect in this collection. He takes us through the backstreets and clubs of the city, into the homes of its inhabitants and in doing so gives us a real sense of the place, its culture and social landscape. Knives and guns seem common place here and it’s an environment where kids and teenagers often have to grow up ahead of their time to survive. Stu has already talked about how this collection illustrates what great short stories can do; they give us a slice of the world as we glimpse people for the briefest of moments. One of the things I liked about these stories was their directness and raw honesty. Longo’s prose is quite stripped back but he quickly creates a sense of tension and atmosphere as he pulls us into these individuals’ lives. I also liked the shifts in tone, mood and pace across the stories. We experience flashes of violence, situations with a pulsating sense of urgency, but there are times when the pace shifts down a gear as characters reflect on their regrets, their hopes and fears. One of the reasons I wanted to get involved in shadowing the IFFP was to discover exciting examples of world-lit with a real sense of place, fiction that vividly captures the voice and the essence of a specific location and/or culture. And that exactly what Ten delivers. Ten is one of three collections of short stories longlisted for this year’s IFFP. The other collections are Revenge by Yoko Ogawa and The Iraqi Christ by Hassan Blasim (and one could also argue that Andrei Makine’s Brief Loves That Live Forever reads as a series of interlinked stories). As for Ten’s chances in the IFFP, I’m at the halfway point in reading the longlist so it’s a little difficult to tell at this stage…but it’s an excellent collection of stories and one which I’m very glad to have discovered. Other members of the IFFP shadow group have also reviewed this collection: Stu, Bellezza, Tony Malone and Tony Messenger – just click on the links to read their thoughts. This review was originally published as a guest post on Stu’s blog (20th March 2014) and Stu has kindly granted his permission for me to republish it here. Ten is published in the UK by Harvill Secker. This entry was posted in Book Reviews, Longo Andrej and tagged #TranslationThurs, Andrej Longo, Book Review, Fiction, Harvill Secker, Howard Curtis, IFFP, Italy, Literature in Translation on May 1, 2014 by JacquiWine.